But breweries in Beer City and throughout West Michigan are learning, sometimes the hard way, that a successful operation needs more than just good beer to distinguish itself in 2016. There’s no shortage of primo fish to reel in from our state’s tens of thousands of inland lakes (including four of the largest lakes in the world) and 300-plus rivers. And yet, nothing compares to an oceanic jewel like fresh king or coho salmon. That’s where Fish Lads comes in — purveying only the finest fillets in Grand Rapids’ own Downtown Market. We talked with Jeff Butzow, owner of Fish Lads, about his aquatic philosophy and plans for the new meat emporium, Carvers, set up just a few feet away. HopCat is opening yet another set of doors this Saturday, Oct. 8 in Kalamazoo. In Kitchen Confidential, the bestselling chronicle of the food industry’s colorful underbelly, Anthony Bourdain warns of the mayhem and mediocrity that can occur “when the chef starts thinking of himself as an artist rather than a craftsman.” But can food be art? 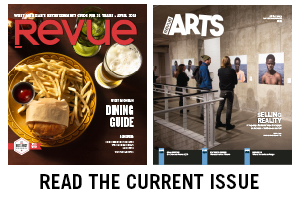 Revue asked some of the area’s top chefs to explain what in the restaurant world, if anything, qualifies as artistic. Several restaurants have firmly established themselves in West Michigan as go-tos for vegetarian-friendly menus. But if you can’t always convince your friends or significant other to patronize those, you can still find good vegetarian food in unexpected places. Consider this your guide to off-brand, below-radar veggie cuisine in Grand Rapids, broken down by meal.